The Synetic Theater's interpretation of "The Picture of Dorian Gray" is a sensual, frenetic and dark portrayal of Oscar Wilde's controversial novel. WASHINGTON – The Synetic Theater’s interpretation of “The Picture of Dorian Gray” is a sensual, frenetic and dark portrayal of Oscar Wilde’s controversial novel. The performance focuses on the life of Dorian Gray, a young man who owns a portrait of himself that is unusually lifelike, and stays true to Oscar Wilde’s original novel. The portrait version of Dorian shows all the physical and emotional consequences of the real Dorian’s hedonistic adventures as time passes, while Dorian himself remains young and attractive in a Faustian, deal-with-the-devil way. In the Synetic Theater’s version of the story, Dorian is still influenced primarily by Lord Henry, a man who frequently pushes Dorian into scandalous behavior. Dorian loses himself so completely that only the destruction of his portrait can bring him back — but with disastrous consequences. The show is reminiscent at times of modern art onstage, to the extent that audience members sitting in the two rows closest to the stage are given red plastic ponchos to wear because of the possibility of being splattered by paint during the performance. Dorian interacts with his portrait, played by an actor who comes out of the portrait’s frame and dances with Dorian and other characters. This freedom given to the portrait lets that performer explore the way the portrait relates to other characters through large physical motions and dancing, instead of with words and gestures initiated by everyone but the portrait. The distress the portrait undergoes and the tension between portrait Dorian and actual Dorian are thus almost existential in nature. While the Synetic Theater is uniquely poised to bring this kind of story interpretation to the stage because of the physical, visual nature of its performances, this show crosses the performance art line too many times. 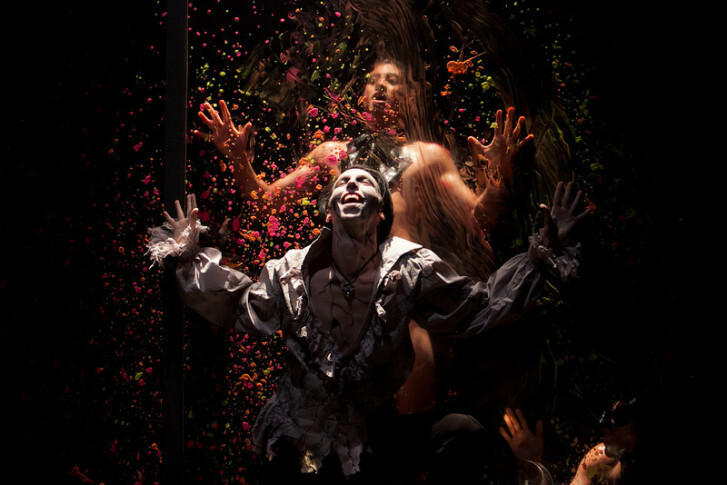 Scenes that simulate Dorian’s sexual, drug-induced depravity as actors pour paint over each other’s bodies go on for longer periods of time than they need to, past the point of artistic necessity. Other modern artistic influences blend well into this interpretation of Wilde’s story, though, including the use of techno music and multimedia elements projected on screens that form the play’s set. The thumping music and the visual confusion of patterns, images, faces and backlit actors used at various moments create an atmosphere of frenetic madness to complement Dorian’s lost soul. The whole performance is very abstract, dark and trippy, with elements of Japanese kabuki theater and a choreographed fight scene at the end that could have been pulled straight from an action movie. Dorian’s depraved craziness is amplified by the creepiness of haunting piano notes. It is not a performance to go see as a family, but it is one that pushes enough boundaries to make Oscar Wilde proud. “The Picture of Dorian Gray” plays at the Synetic Theater in Arlington, Va., through Nov. 3.